The younger (lower gravity) sibling of one of my absolute favorite beers. Pours a much thicker blackish-brown liquid then I would’ve expected with some hints of golden yellow when held up to the light and a thin coating of light brown head on top. That 9.2% presents itself front and center to my nostrils followed by the standard Belgian assortment of fruits like bananas and pears. One day I have to figure out why so many Belgian Ales smell like bananas, as far as I know they aren’t really native lol. The taste is… complex and delicious. A helping of brown sugar from the malt, a bit of grain, barely spicy and slightly present alcohol (less noticeable here than in the smell). Beautifully smooth mouth feel with medium body, medium carbonation and a slight warmth from the alcohol. 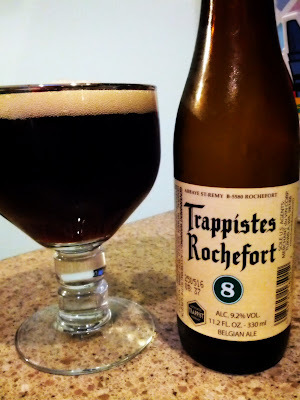 I’ve long been a fan of the Rochefort 10 which I initially purchased based off the Belgian style + 11.3% ABV. I’ve had that many many times but this is my first experience with the 8 and it is quite a pleasant one. I definitely prefer the 10 but this is still a great and complex beer. Easy 4.5/5 rating, I would’ve bumped to up to 5 if it wasn’t so heavy on the malt. P.S. I picked this up at Jungle Jim’s but have also seen it at Party Source and most better beer sellers. I love this beer, though slightly less than Rochefort 10.